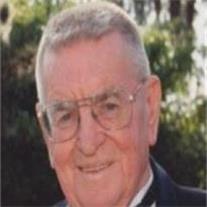 Robert L. (Bob) Richardson, 91, passed away Friday, August 6, 2010. A 27-year resident of Chandler, Bob succumbed to cancer and was surrounded by family members at the time of his death. Bob was born September 27, 1918 in McCall, Idaho. On September 3, 1941 he married Dorothy Sue Carroll who preceded him in death following 64 years of marriage on December 13, 2005. Bob is survived by their three children, Bobby Richardson, Ulysses, KS; Darlene Cervantes, Spokane, WA; and Donna Swaving, Chandler, AZ. In April, 1942, while serving with the Army Air Corps’ 7th Material Command, Bob was captured in the Philippine Islands and spent the next 3 ½ years in various Japanese POW camps. He was liberated in August, 1945 and returned to the United States to start his family and begin a successful career in the transportation industry. Bob’s greatest pleasure came from creating things with his hands. During the many years he lived, first in Albuquerque, NM and later in Chandler, Bob built numerous homes, boats, grandfather clocks, cabinets, toys and R/C aircraft. Additionally, he was an avid golfer, a dedicated bowler and a proud member of the East Valley Aviators Club. In addition to his children Bob is survived by a daughter-in-law, Lupita Richardson, and two sons-in-law, Steve Cervantes and John Swaving; a sister-in-law, Peggy Simmons, Amarillo, TX; two very special nieces, Lora McAllister, Mesa, AZ and Thelda Ratzat, Casa Grande, AZ; and 8 grandchildren: Tiffany Loftin, David Richardson, Lance Richardson, Steven Cervantes, Monte Cervantes, Byron Royal, Darrin Royal and Michelle Norman. In addition he leaves behind 19 great-grandchildren: Anna Kate, Abigail and Isaac Richardson; Evan and Troy Loftin; Monte, Jr., Megan, Adam, Rebecca, Joshua, Michael and Timothy Cervantes; B.J., Billy, Daniel and Dakota Royal; Trent, Carissa, and Nicolette Norman; and a very recent great-great granddaughter, Izbella Royal. A public viewing will begin at 9:30AM on Thursday, August 12, at Bunker’s Garden Chapel, 33 N. Centennial Way, Mesa, followed by a Memorial Service at 10:00AM with David McAllister officiating. Interment will follow at 11:45 AM at Valley of the Sun Cemetery, 10940 East Chandler Heights Rd, Chandler, AZ.